Every morning at school, Mrs. Millie says, "Please hang up your book bugs." The kindergarteners know she means book bags, and they laugh whenever their teacher talks silly. 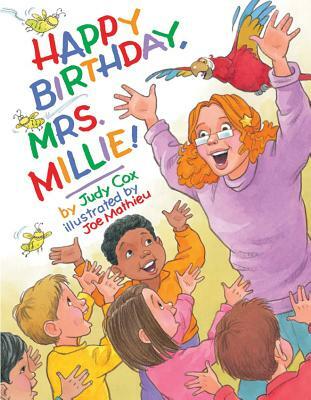 On Mrs Millie s birthday, the children decide to throw a surprise party. They decorate the classroom with baboons (balloons) and set out chocolate cubcakes (cupcakes) and apple moose (juice). Mrs. Millie has never enjoyed such a wonderful bird-day! The illustrations rendered in Prismacolor pencil, dyes, pen, and ink highlight the fun in this classroom romp.